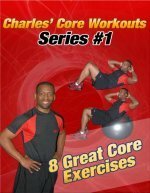 This page has 3 abdominal exercise variations to strengthen your abdominal muscles. There are many ways to exercise your abdominal muscles. You can use ab machines, exercise balls, or dumbbells. But if you don't have any ab exercise equipment, you can always rely on the floor to give you a good ab workout. Here are 3 stomach exercises that you can do on the floor with no equipment. Starting Position: Begin by lying on your back with your hands at your sides. If you need a little more support, it's okay to place your hands underneath your hips. Form: While keeping your pelvis stable, alternate kicking your legs in the air in a swimming motion. Move rythymically and perform 10-25 repetition on each side. Personal Trainer Tips: It is really important that you maintain the position of your pelvis and lower back during this exercise. If you have difficulty keeping your lower back stable, try an easier exercsie such as reverse crunches. Once you master reverse crunches move on to leg raises and then flutter kicks. Starting Position: Begin by sitting on the floor with your knees bent and your hands on the floor for balance. Form: Inhale and recline your body backwards as you extend your legs straight in front of you. Hold briefly before bringing your knees towards your chest and forming the letter V.
Personal Trainer Tips: This can be a challenging exercise. Because the legs are moving it puts slightly more pressure on the lower back when compared with ab crunches. Listen to your body and move in a controlled manner. Starting Position: You can perform this exercise from 2 positions. You can lie flat on your back, or you can prop your upper up on your elbows as shown in the picture below. Form: This exercise has 3 parts. First, lift your legs to about 45 degrees. Second, your legs about 45 degrees. Third, bring your legs together and cross one leg over the other like a pair of scissors. Repeat the scissor motion but alternate which leg goes on top. Perform 10-25 scissor kicks on each side and then rest. Personal Trainer Tips: This abdominal exercise works the legs and the abs, so if you feel fatigue in the front of your thighs or inner thighs that's okay. Be mindful of your posture and try to keep your neck and lower back in good alignment. These abdominal exercises all involve moving the legs. When the legs are moving there is slightly more pressure on the lower back. It is a good idea to stretch your lower back muscles after doing these exercises. Listen to your body and always move in a controlled manner.